When you were a child, who or what did you want to be when you grew up? As a child, I dreaded the Christmas visits to aunts and uncles. Every year they would ask me the same question: “What do you want to be when you grow up?” I hadn’t a clue. In many societies, you are expected to join the family trade or you may become an apprentice to a master craftsman. That’s how my grandfather Lewis learnt his trade. My great-grandmother paid a local carpenter to take Lewis on as a young boy and teach him carpentry skills. I still have his articles of indenture. My grandfather became his pupil, a learner. Then when he too became a master craftsman, he took on my father who became his disciple. I broke the family tradition although I’m pretty good at putting Ikea furniture together. The greatest tragedy in life is not death, but life without meaning, without purpose. Many people go through life without ever discovering God’s purpose for their lives. We are not an accident. We were created for a purpose. We were made to have meaning. In his book, The Purpose Driven Life, Rick Warren says “Without God, life has no purpose, and without purpose, life has no meaning. Without meaning, life has no significance…” In our Gospel reading we learn about God’s purposes, not just the first disciples, but for us too. The context for their meeting with Jesus begins in verse 35. John the Baptist describes Jesus as the Lamb of God. The Jews were familiar with lambs for sacrifice. At Passover, each family would bring a lamb to atone – to hide their sin temporarily, from before God’s eyes. Until the next annual sacrifice. But John the Baptist describes Jesus as ‘The Lamb of God who takes away the sin of the world’ (John 1:29). Not just hides sin, not just covers sin, but literally takes away sin. And not just Israel’s sins either but the sins of the whole world. The primary reason God created us is to know him. This was a command not an invitation. “Come,” literally means “come here…. your destiny is to follow me!” For the disciples, this meant leaving their nets, their father, their boats. In 1st Century Palestine it was the norm for disciples to choose their rabbi. Like the way people tend to choose their church today for a particular style of worship or preaching or for convenience. Here Jesus does the choosing. This was a passionate call. “Come, follow…” conveys the idea of following as a learner, an apprentice, committed to imitating the one being followed. It conveys a path, a destination. This was a passionate call. A purposeful call. “Come, follow me” Jesus calls us to follow him, not join a denomination or a church but himself. Have you responded personally to the call of Jesus to follow him? This is our primary purpose in life. The call of Jesus is a passionate, purposeful and a personal call. The disciples’ obedience was immediate: They left their nets and followed Jesus. Will you follow Him, where ever he leads in 2018? The Call of Jesus is to know Him, to follow Him. If our primary purpose is to know him, our second purpose is to serve him. Notice how Jesus responds. He asks a question. He tests their motives. Following Jesus must be a conscious decision we each choose to take. 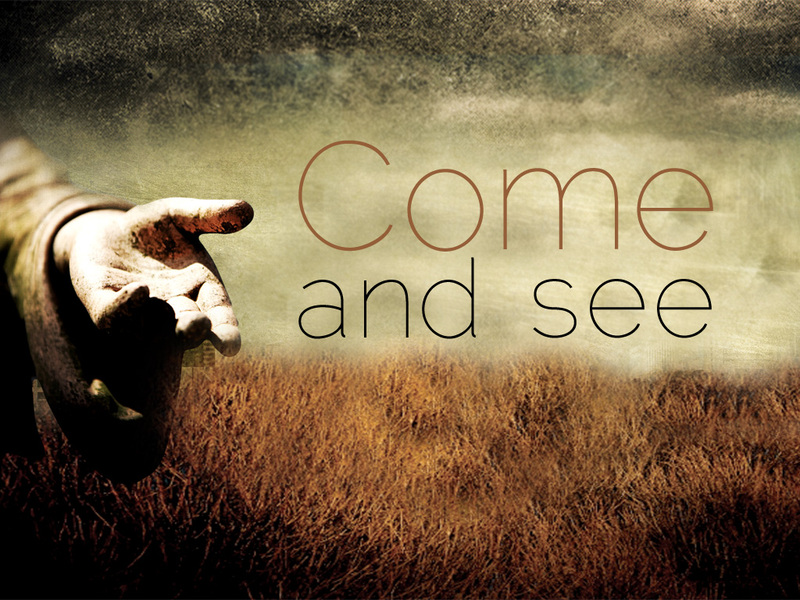 Jesus says “What do you want?” “Why are you following me?” Because someone brought you? Because it is expected of you? Or because you want to find out more about me? Jesus invites them to be with him. He doesn’t invite them to a service or to a meeting but to his home. He calls them to follow him home and join his family. In the gospels Jesus describes his disciples as his brothers and sisters. So, let me ask you, why are you here this morning? Because you have always attended church? Because you like the music or the liturgy? Or because you want to be with the family of Jesus and serve them? God’s first purpose? The call of Jesus is to follow Him. God’s second purpose? The community of Jesus is where we serve Him. And God’s third purpose for us? To share Him. Mark, in his gospel, elaborates on the call of Jesus. After spending a day with Jesus, what is ‘the first thing’ Andrew does? He finds his brother, Simon, and tells him, “We have found the Messiah”” (John 1:41). That was his testimony. Messiah simply means “the anointed one”. The long awaited Saviour. Notice the sequence. Andrew tells Simon about Jesus. Andrew brings Simon to meet Jesus. Andrew and Simon follow Jesus. And notice the same sequence with Philip the next day. Philip meets Jesus. Philip tells Nathaniel about Jesus “We have found the one…” Philip urges Nathaniel to meet Jesus “Come and see…” Philip brings Nathaniel to Jesus. Nathaniel trusts in Jesus also. When Nathaniel met Jesus, he discovers that the Lord already knows all about him. No wonder these first six disciples are eager to introduce their friends to Jesus. What can we learn from them? As they shared news about Jesus it was neither contrived nor self-conscious, neither forced or artificial. It was spontaneous. It was infectious. It was effective. Why? Because they had been with the Lord Jesus Christ. They could not help but speak of him to others. Our first purpose is to know Him because the call of Jesus is to follow Him. Our second purpose is to serve Him through the church, because the community of Jesus is His family. Our third purpose is to share Him because the concern of Jesus is for the lost, for those who do not yet know, love and serve Him. In the Acts of the Apostles, we discover how the church lived out these purposes in the face of opposition, hostility and persecution. What was it that confounded the authorities when they tried to suppress the Church? “When they saw the courage of Peter and John and realized that they were unschooled, ordinary men, they were astonished and they took note that these men had been with Jesus.” (Acts 4:13). They had been with Jesus. They had been with Jesus. May the people we meet this week, reach the same conclusion about us. Lets pray. Dear Lord, help me discover your call and purposes for my life so that I might know you, love you and faithfully serve you all the days of my life. Please make my love for you so infectious that others will come to know you too, and one day I may hear you say, “We’ll done, my good and faithful servant.” In Jesus’ name, we pray. Amen. This entry was posted in Evangelism, Sermons, Theology on January 14, 2018 by Stephen Sizer.